Last week Rights & Reproductions: The Handbook for Cultural Institutions was published by the Indianapolis Museum of Art and American Alliance of Museums. Read the official press release here: http://www.imamuseum.org/sites/default/files/attachments/RR%20Handbook%20PR%20FINAL.pdf. After two years of in-depth work on the Handbook, it is my great pleasure to see the efforts of so many people come to fruition and be released to the public. As I have taken to calling the Handbook, my third “child” has now been born—a bouncing baby ePub. Cover design for the publication. Artwork depicted: Edward Hopper (American, 1882–1967), Hotel Lobby (detail), 1943, oil on canvas, 32-1/4 x 40-3/4 in. Indianapolis Museum of Art, William Ray Adams Memorial Collection, 47.4 © Edward Hopper. The Handbook is the first publication available to rights and reproductions specialists that focuses solely on the guidelines, established standards and emerging best practices in this field. As defined in the Handbook, a rights and reproductions specialist refers to anyone working at a cultural institution who handles this type of work, including but not limited to registrars, rights and reproductions managers, archivists, librarians and lawyers. Writing, editing and designing Rights & Reproductions: The Handbook for Cultural Institutions has been, relatively speaking, the easy part. The true “work” has been the coordination of all the moving parts associated with its production. Getting the IMA and AAM in line as the publishers, bringing together over 20 contributing authors and legal review panelists, the IMA’s receipt of the National Leadership Grant from the U.S. Institute of Museum and Library Services (IMLS), and the Getty Foundation’s support of its production as a digital publication utilizing the Online Scholarly Catalogue Initiative (OSCI) Toolkit are the only reasons it is now available for purchase. As one of the contributing authors recently quipped, “Anne, you are now awarded the title ‘Champion Cat Herder,’” which I humbly accept. Over 400 “pages” of text and almost 800 footnotes (just four shy, which is simply annoying). An overview of Intellectual Property (IP) law, ethics and risk (in the United States) and other personal, moral, and third party rights compared with the broad differences found in international IP rights. Discussion of the importance of maintaining an IP policy, considering open access policies and conducting regular IP audits. 50 references each to Creative Commons and open access and over 170 references to fair use and/or fair dealing. Rights issues in permanent collections: determining the rights status of collection objects, identifying rights holders and preparing non-exclusive licenses. Use of materials with IP considerations, including, but not limited to, publications and exhibitions, educational materials, websites and social media, marketing and promotion, and retail and commercial products. Varying processes employed for clearing permissions and sourcing materials, as well as when a utilization of fair use is appropriate and the types of attribution required. Over 20 case studies that outline real-world examples from the contributing authors’ experiences and practices at their respective institutions. The process of expanding audiences and potential revenue generation by leveraging collection content with external distribution partners. Analysis of communicating IP to the public, including licensing materials to external users and the evolution of photography policies. Direct hyperlinks to external sources and related articles within the footnotes, appendices and bibliography as well as embedded video files. Four appendices: international treaties, federal legal materials and court decisions; document and contract templates (over 100 pages! ); terms and definitions; and references and resources. If you haven’t already, I encourage you to skip the morning stop at the coffee shop and purchase your copy of Rights & Reproductions: The Handbook for Cultural Institutions. Available now for purchase through AAM’s website at https://aam-us.org/ProductCatalog/Product?ID=5186 for $4.99 USD (non-members and Tier 1 members) and $1.99 USD (Tier 2 and 3 members). 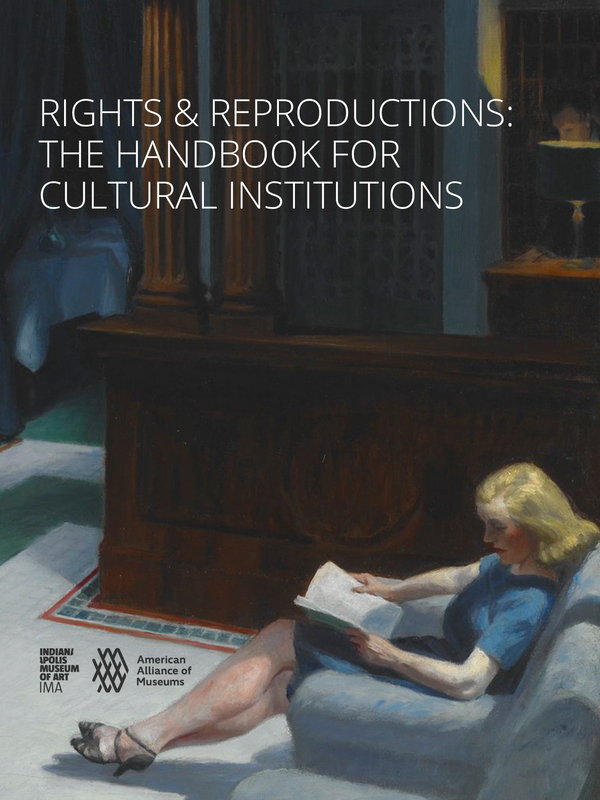 Rights & Reproductions: The Handbook for Cultural Institutions is made possible by a grant from the U.S. Institute of Museum and Library Services. The project utilizes the OSCI Toolkit, which is supported by the Getty Foundation as a part of its Online Scholarly Catalogue Initiative. I would like to know if I can purchase a copy of the pdf and make a copy for our Library collection? This will help settle the shyness of various sister institutions in sharing their historical documents for reference only and not for re-publication (or single publication rights) while they retain all their property rights to the original material.